Bro, did you check the composition of the salt as written on the package? I believe it will be just 100% salt. 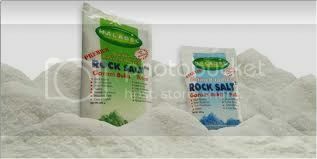 Salt does already have "anti-bacterial properties" in its natural form. Unless they added any other chemicals in this product then maybe they can claim it to have "anti-bacterial properties" otherwise it would probably be just a marketing gimmick. Furthermore, if you want to use it for koi pond, you would need a lot (1 kg for every ton of water will only give you a salinity level of 0.1%) hence these small packages would not be economical for use. evening bro's...ah yes....i believe it just marketing gimmick.never bought it just took some photo's and ask any sifu on this.i use normal sea salt or "garam batu/kasar" much more cheaper then those above.thanks for the feed back bro's. can use this one ?